The last 15 years have been among the most turbulent on record. Since the year 2000, America has experienced two recessions (including a near depression), two stock market crashes, numerous selling panics, two terrorist attacks, and one of the slowest economic recoveries on record. Just when it appears there might be some light at the end of the tunnel and the consumer is getting his confidence back, the threat of global deflation has appeared and has given them reason to remain cautious. This time around the threat of deflation is coming from overseas, specifically from China. Thankfully, the near brushes with deflation in the last 15 years have all been averted so far due to the aggressive monetary policy responses of the US central bank. Every time deflation reared its ugly head, the Fed was right there to ensure prices didn’t stay low for long. In doing so, however, the Fed has short-circuited the natural process by which the economy is periodically cleansed of economic excess. The natural cycle of deflation also brings an important adjustment in the cost of living for everyone, especially the savers among us. Those who sacrifice spending in the immediate term are typically rewarded for their thrift by the long-term economic cycle. This time, though, the long-term deflation cycle wasn’t allowed to completely run its course. The net result was that savers were essentially punished for their thrift while debtors were exonerated. It means that the natural economic order was turned on its head by central bankers. This begs a number of important questions: 1.) Does this mean the cycle inflation and deflation known as the K-wave has been defeated by the Fed? 2.) Or will the natural order eventually reassert its primacy over central bank manipulation? 3.) Has the Fed run out of ammunition for mitigating future economic downturns? Samuel “Bud” Kress, for whom the long-term Kress cycles are named, taught that when it comes to attempts by government to circumvent the long-term cycles, “Mother Nature and Father Time” always prevail in the end. If Bud were alive today I have no doubt he would maintain the Fed’s impotence in ultimately destroying the long-term economic cycle of inflation/deflation. The effects of the long-term economic cycle, he always asserted, must win out. The long-term cycle of inflation/deflation identified by Kress has a period of 60 years and is roughly analogous to the more widely known Kondratieff Wave (K-wave). According to Kress’ numerical system, the cycle was to have bottomed in late 2014. The period between 2000 and 2014 encompassed the deflationary portion of his cycle, and it was during this time that the US economy experienced most of the aforementioned turbulence. During this time frame the closest the US came to the deflationary depression predicted by Kress was in 2007-2008. The Fed stepped in, however, and unleashed record amounts of liquidity in a furious attempt at reversing the deflationary spiral. Its efforts proved successful as depression was averted and prices recovered in the years that followed. Yet the threat of deflation is ever present and remains a constant bugbear of central bankers, especially in Asia and Europe. The US Fed may have succeeded in forestalling deflation, but the austerity programs pursued by other countries in 2009-2015 are coming back to haunt them. The interrelated global economy so passionately defended by many has revealed its ugly underside. Deflation, it turns out, can be spread abroad even to countries that aren’t directly experiencing it at home. A classic symptom of the deflationary pressure many countries are experiencing is the steep decline in commodity prices. The Reuters/Jefferies Commodity Research Bureau Index (CRB) is the benchmark price index for the broad commodities market. 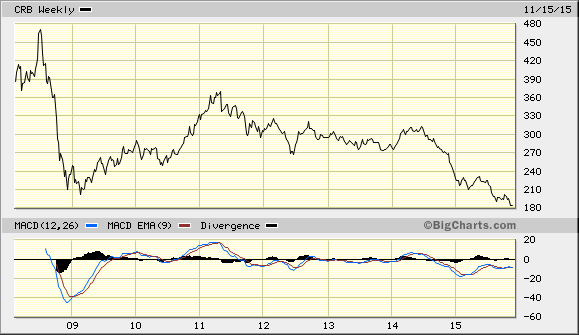 As the following graph illustrates, the CRB is at its lowest level since the 2008 credit crisis. This depressed level reflects the lack of industrial demand owing to the global economic slowdown. When monetary policy fails, the classic political response to deflationary pressure of this magnitude is to start a war. War is inflationary and always succeeds in boosting commodity prices and industrial production to above normal levels. The military adventures of the US between 2002 and 2011 contributed to an historic boom in commodity prices and likely forestalled the early onset of deflation after the 30-year cycle peaked in late 1999. There is also a 24-year cycle component of the Kress system which typically harbingers war. The last few times this cycle bottomed it was followed by a major military conflagration involving the major Western countries. The most recent 24-year cycle bottomed in late 2014. It will be interesting to see if any nations pursue this course of action in the years immediately ahead, especially in light of recent developments. Of interest, the Dow Jones US Defense Index (DJUSDN) suggests that perhaps preparations to that effect are in the making. In answer to the question of whether the Fed has succeeded in destroying the long-term deflation cycle, the evidence points to the negative. While there’s no denying the mitigating influence that six years of QE had on US equities, the billions of dollars created by the Fed failed to produce any discernible inflation in the broad economy. The fact that interest rates and commodity prices remain near historic lows illustrates this failure. Essentially, there are two possible outcomes to the global economic slowdown: 1.) Either natural market forces will be allowed to run their course, or 2.) Governments will intervene with a vigorous monetary policy and/or military response. The latter option is the most likely outcome based on history. Although the central banks of China and Europe have already introduced stimulative monetary policies, these policies have so far failed at reversing the deflationary undercurrents still present in the global economy. A much more aggressive stimulus effort will be required to achieve the effects desired by central bankers and bureaucrats. It’s questionable whether they have the political will to do this, however. By far the quickest route to reversing low commodity prices is the warfare route. War lifts prices much faster than even the most aggressive QE could ever do. As undesirable as it is, war unfortunately remains the most likely choice for governments desperate to boost their economies at any cost. 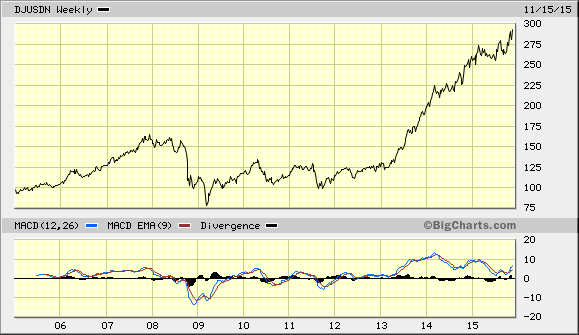 The short answer to the question, “Has deflation been defeated?” is “No,” at least not yet. It will either be allowed to finish its course, which is a salutary and beneficial outcome for consumers. Or it will be prematurely circumvented by policy makers, as it was in the US, to the detriment of the many and the benefit of the few. History suggests the latter course will be the one most likely chosen. The moving average is one of the most versatile of all trading tools and should be a part of every investor’s arsenal. Far more than a simple trend line, it’s also a dynamic momentum indicator as well as a means of identifying support and resistance across variable time frames. It can also be used in place of an overbought/oversold oscillator when used in relationship to the price of the stock or ETF you’re trading in. In my latest book, Mastering Moving Averages, I remove the mystique behind stock and ETF trading and reveal a simple and reliable system that allows retail traders to profit from both up and down moves in the market. The trading techniques discussed in the book have been carefully calibrated to match today’s fast-moving and sometimes volatile market envipolment. If you’re interested in moving average trading techniques, you’ll want to read this book.